Although we live in an era that is dominated by cloud services, you might not always want to have all your data uploaded somewhere on a server. This is the main reason why people still prefer to invest in external hard drives that promise much more storage space. At the same time, some people prefer to invest in a SSD rather than in a HDD. The main difference between these two types of drives is that the SSD has less power draw, yet it is more expensive, while the HDD is more affordable. On the other hand, HDDs can be found at capacities of up to 10TB for desktops, while SSDs have a maximum capacity of 4TB for desktops. When it comes to the encryption type though, both types are available on the market with full disk encryption. 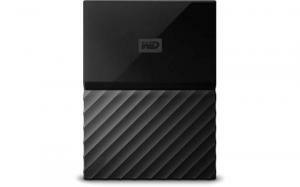 It is hard to say which external hard drive is the best for everyone’s needs, as we don’t all want the same things. The storage is one of the most important factors, based on which most users make their buying decisions. The next most important thing is the size and interface that the HDD uses. Its connectors, design, weight, transfer speed, cache space and access times are just a few of the other factors that might have a high influence. The price, warranty, portability and ease of use shouldn’t be neglected either. After all, we all want to buy the best products, at fair prices and to enjoy them on the go. If you are looking to buy the best portable external hard drive for your personal or business laptop, then you should take a look at the five most popular devices below. We have selected some of the most popular HDDs on the market right now and analyzed their features based on consumers’ reviews and personal observations. Check out each product’s pros and cons before making a decision, so you will know that you have chosen wisely. If you are tired of bulky devices that are difficult to handle and to carry while traveling, then you will be glad to see that this HDD is compact, thin and gorgeously designed. This model from My Passport series measures 4.3 x 3.2 x 0.9 inches and weighs only 8.2 ounces. It practically fits in the palm of your hand and has the same weight as an external battery for your smartphone. It has a 4TB storage capacity, automatic local and cloud back-up, as well as password protection. This device also has 256-bit hardware encryption that has no impact over the HDD’s performance. Owning the My Passport ultra-portable external hard drive is great if you have a lot of media to store and you don’t want to overload your laptop or computer. Also, if you have a business and you want to keep your files safe at all times, it is a great investment, as it gives you the ability to double back-up them. The 3-year warranty coverage gives this product a lot of credibility. If, besides technical characteristics, you also value the design of the products that you buy, then you should know that you can choose from five color options of this device. They are all stylish and meet the requirements of pretentious users. 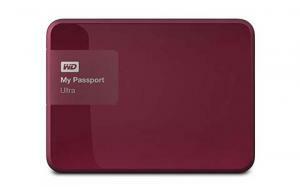 If you are looking for a more affordable external hard drive that is highly portable, then you will like this model from Western Digital. It comes in eight different colors, it has a sleek design and it has great specifications that might just convince you to buy it. Its 4 TB storage capacity is great for users who have huge amounts of media files that need to be kept safe. Also, it has automatic back-up capabilities, including WD back-up software. Thanks to its password protection and hardware encryption, you can rest assured that your data is completely safe. This external hard drive has a USB port that is compatible with USB 2.0 and 3.0 cables. As to the operating systems that it can be used with, Windows 10, 8 and 7 are perfectly compatible. If you want to use it with Mac, though, you will have to reformat it. This product is easy to use and doesn’t require special set up. After unboxing it, all you have to do is connect it with your laptop or computer, load the WD Apps setup and start transferring data. Hardware-wise, it is a sturdy, well-built HDD that has a high-quality case and an amazing finish. It measures 4.3 x 3.2 x 0.8 inches and it weighs 8.6 ounces, so it is great for traveling. 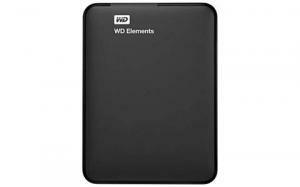 As it was stated in the introduction part, the best external hard drive is the one that meets your requirements. If you don’t need large storage space, then why invest in a product that has a 4TB capacity? This 2TB HDD is ideal for those who need extra space, but they have a limited number of media files that they want to secure. If you are one of those users, then you will love this device. It is nicely designed, it comes in elegant black and it has a compact shape. By paying a much lower price you get an HDD that is USB 30. And 2.0 compatible, fast data transfers and WD quality. This product is small and lightweight, does the job that it was built for and is great for traveling. It weighs 4.3 x 3.2 x 0.6 inches and weighs 7 ounces, which makes it highly portable and comfortable to use. However, it doesn’t have any advanced safety features, by comparison to the first products in our list. For instance, it doesn’t have automatic cloud back-up, password protection or hardware encryption. Also, it is quite sensitive to shocks. It is compatible with both Windows and Mac operating systems, yet it needs reformatting. After unboxing it, all you have to do is reformat it, without all the setup hassle. Are you looking for a small, yet efficient external HDD that you can take with you anywhere? 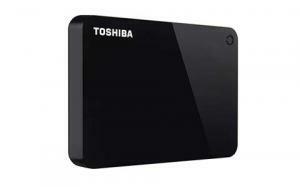 Toshiba is renowned for its high-quality products and the emphasis that it puts on technology. This 1TB portable external hard disk is a nice, small and lightweight device that can help you store media files and documents using the plug and play technology. This eliminates the need of installing additional software and lets you use it right away. Its design is sleek and compact, so you will have no trouble storing it anywhere in your office or in your laptop bag. This product has a USB port that is compatible with 3.0 and 2.0 cables, so that you can transfer data fast and comfortably. No external AC power cord is needed to keep this device on. The Canvio model from Toshiba is easy to use anywhere you go, can be used with all operating systems after reformatting it. It measures 4.3 x 3.1 x 0.55 in, weighs 5.28 ounces and has an aluminum casing for durability and sturdiness. If you want an HDD that can be used right away, that is affordable and that will satisfy your basic data storage needs, then you should look at this device twice. The Canvio Advance model is Canvio Basic’s bigger brother and comes with more advanced specifications, yet the same affordable price and the same storage capacity. Thanks to its stylish design, using it is always a pleasure. It comes in three different color options that you can choose from: black, blue, red and white. Its 1TB capacity is ideal for personal use, especially if you only want to store a limited number of files. It has a contemporary design, it is lightweight and perfect for your travels. It measures only 4.3 x 3.1 x 0.55 inches and it weighs 5.28 ounces. This is a model that was launched in 2018 and that brings Toshiba’s fans the portability and durability they need. By comparison to the basic HDD model, this one has automatic back-up capabilities, using the Toshiba Storage Backup Software, password protection and Toshiba Storage Security Software, which can be downloaded locally. This way, you can rest assured that your files and data are safe in case of unexpected damage of the device. Installing and using this HDD is easy, as it doesn’t need any additional installation software. Also, you will be glad to know that it is covered by a 2-year warranty. External hard drives have been taken to a whole new level. Especially in the past few years, as technology evolved considerably, HDDs have become highly performant, lightweight and versatile. They are more than external hard drives; nowadays, they are devices that you even come to enjoy using thanks to their gorgeous designs, their light weights and their much higher transfer speeds. If you are looking to buy an HDD that is easy to store in your laptop’s bag, you travel a lot for business purposes and you need a lot of storage capacity or you have a huge number of files that you would simply like to keep safe, then such a device is exactly what you need. Most HDDs are compatible with all operating systems, especially Windows and Mac, but you might want to check this aspect out before making a purchase. The best thing about some of the modern external hard drives is their ability to store a back-up of your files in cloud. Also, they have great encryption, USB 3.0 compatibility and are covered by a two or three-year warranty. Before making your decision, ensure that you are aware of the pros and cons, by analyzing thoroughly the five products in our list.